[Guest Post] Are You Making One of These Morning Routine Mistakes? 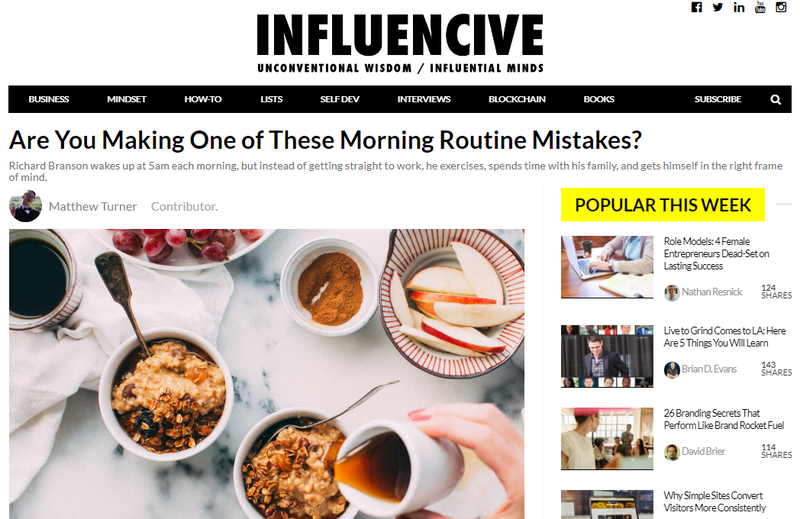 I recently published an article on Influencive.com where I focus on a few morning routine mistakes that you may be making. I wanted to tell you about this post here, and if you like what you see, you may like to read the rest. Richard Branson wakes up at 5 am each morning, but instead of getting straight to work, he exercises, spends time with his family, and gets himself in the right frame of mind. “Over my 50 years in business I have learned that if I rise early I can achieve so much more in a day, and therefore in life.” he says. Pick any person you admire—the world’s thought leaders, billionaires, and uber successful—and you will find someone who wakes up early and dedicates themselves to their morning routine. But it isn’t as easy as waking up early and expecting instant success. There are certain do’s and do not’s when creating your morning routine, so if you find yourself making one or more of these morning routine mistakes, you may sabotage your future success. Like what you have read so far…? If you enjoy what you read here, you may like to join my tribe. Fancy joining this rabble rousing adventure? Sure Thing Turndog… Sign Me Up!